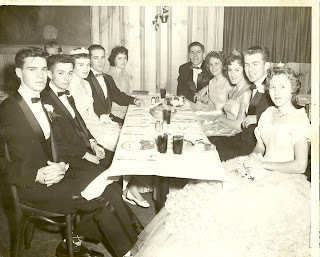 Among the pictures from my mother’s senior prom, I was surprised to find a shot of my parents and five other couples seated in a nightclub! How was it that the generation before me lived such a glamorous life far beyond the typical after-party at a friend’s house that I knew? The answer: The Latin Casino. Though Philly teenagers were more likely to take the subway rather than a limo to the prom in the 1950s, their evenings-to-remember didn’t completely lack sophistication. 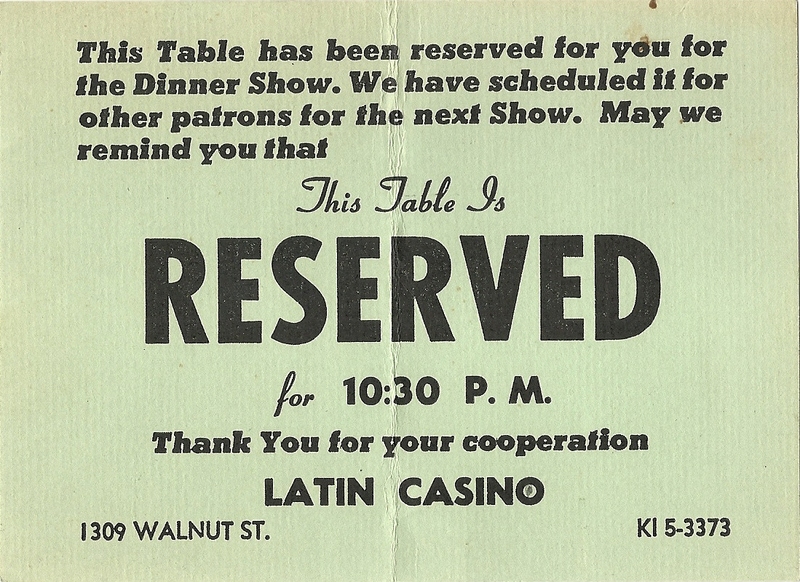 Many a prom evening ended at the Latin Casino, the city’s premier nightclub at the time. Poised at the gates of adulthood, promgoers might be facing the work-a-day world in a matter of months, but they were allowed a glamorous night out at the place to see and be seen. 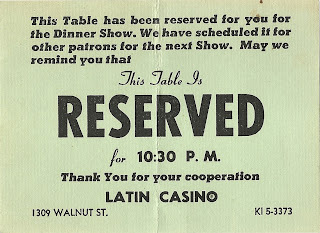 The Latin Casino opened at 1309 Walnut Street in 1948. Its expansive basement room seated 500 people and hosted a constellation of stars, including Martha Raye, Milton Berle, Lena Horne, Danny Thomas, Jimmy Durante, Jerry Lewis and Dean Martin. 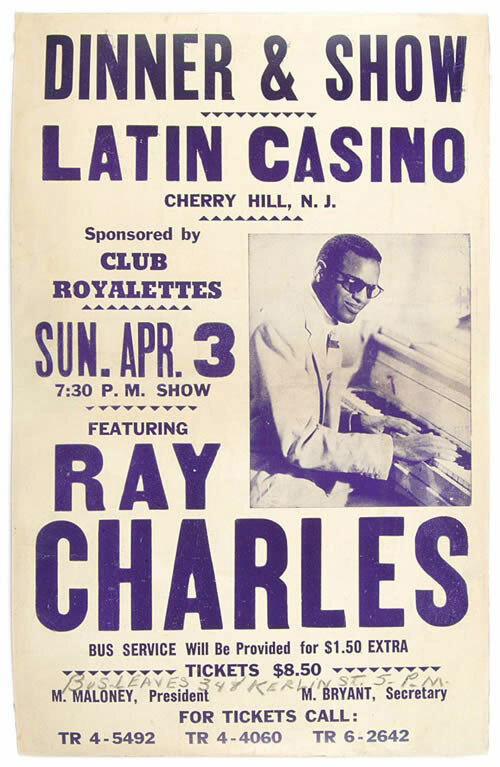 With a band and a chorus line, it was Center City’s most sophisticated nightspot at the time. In 1960, the Latin Casino moved across the bridge to Route 70 just west of the Racetrack Circle in Cherry Hill. Like many other establishments, it was drawn to the near-suburbs of Philadelphia, enticed by free parking and more lax regulations that allowed the alcohol to flow past midnight on Saturdays. With seating for as many as 2,000 patrons, it became one of the largest supper nightclubs outside Las Vegas. 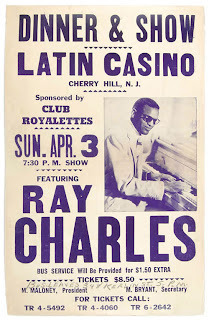 During the 1960s and into the early 1970s, the Casino still hosted old-school acts like Frank Sinatra, Sammy Davis Jr. and Totie Fields, but it loosened its collar a bit, also hosting the likes of Ray Charles, James Brown, the Supremes and the Spinners. For about $30 a piece, showgoers were treated to a meal and a concert. No small sum, it was a special night out, and patrons dressed the part, arriving in tuxedos and evening gowns, or at least suits with ties and cocktail dresses. Sinatra performed two weeks a year at the self-proclaimed “Showplace of the Stars.” Perhaps you once caught a performance at the Latin Casino Theatre Restaurant by Harry Belafonte, Engelbert Humperdinck, Johnny Mathis, B.B. King or Tom Jones? Once Atlantic City casinos provided a more fitting site for lounge acts, it became clear that the days of the faux Casino were numbered. And with the casinos willing to offer seven-figure multi-year contracts to entertainers like Don Rickles, clearly the game became too rich for the blood of Latin Casino owner Dallas Gerson, and the nightspot closed in 1978. Later its owners tried to resurrect the entertainment mecca as the Emerald City disco. After all, suburbanites with Saturday Night fever had to have some place to go. Alas, disco was not long for this world, and neither was Emerald City. Within a few years, the building was demolished and became the site of Subaru of America headquarters. What memorable performance did you see at the Latin Casino? Was it better when it was in Philly or Cherry Hill? Tell us more.